Make a difference this Easter! Our friends at Milliemanu have given us two of their fabulous Buster Bunnies to give away in our Eggcellent Easter competition. It’s such an innovative, eco-friendly Easter gift supporting a great cause we wanted to let you know how you can make a difference this Easter. 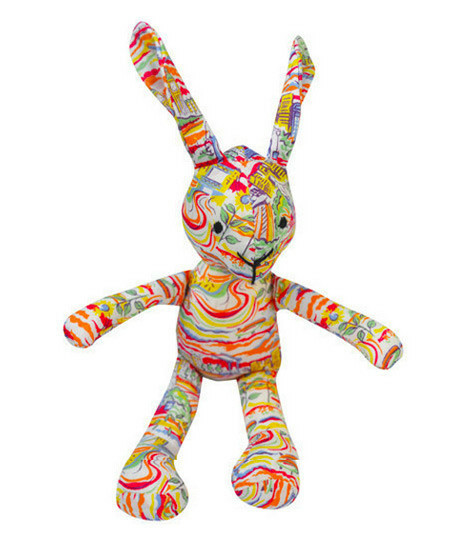 Childrenswear label milliemanu are teaming up with Kids Company and donating all the profits of the sale of their up-cycled, child poverty busting ‘Buster’ bunnies to the charity to help London children in poverty enjoy a nutritious meal this Easter. This Easter an unprecedented number of children in the UK are facing the most harrowing and desperate conditions. The question won’t be whether they eat too many Easter eggs but will they eat at all? There are 3.6 million children living in poverty in the UK today, that’s more than one in four, with nearly half of children in inner city London living in poverty (approx. 600,000). Children’s charity Kids Company has seen the numbers of children referring themselves to their street level centres more than double in the last year, most children simply asking for food. Kids Company provides hot nutritious meals to over 2000 children each week, 85% of whom rely on the charity for their main meal of the day. Despite the UK’s wealth, growing numbers of children in the UK are experiencing severe poverty. “With the most appalling situation right on our doorsteps, research suggests this Easter many children could be consuming up to five times their daily recommended calorie intake in chocolate, blissfully unaware of the plight increasingly faced by large numbers of their peers. We thought it was time to try and encourage something different. By giving one of our Easter Bunnies, customers are not only raising enough money for the Kids Company to provide meals for up to 10 children but helping to raise awareness of this terrible situation and encourage positive socially responsible attitude in the next generation. Each Buster bunny is handmade in London from up-cycled, high quality Liberty print fabric off-cuts from milliemanu’s main collection of childrenswear and therefore has an entirely unique character as well as ethical credentials. The bunnies will be available to purchase from 1 February through milliemanu’s website for £19. Pop over to Kids Company’s Facebook Page to find out more!